"My wife, who is of Ukrainian nationality, has weekly contact to her parents and friends in Zhytomyr [NW Ukraine]. According to them, most protesters get an average payment of 200-300 grivna, corresponding to about 15-25 euro. As I additionally heard, one of the most active agencies and 'payment outlets' on EU side is the German 'Konrad Adenauer Stiftung,' being closely connected to the CDU, i.e., Mrs. Merkel's party." 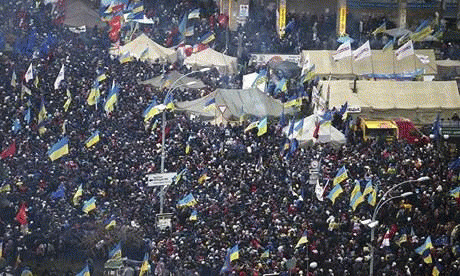 As I reported on February 12, "Washington Orchestrated Protests Are Destabilizing Ukraine." Assistant Secretary of State Victoria Nuland, a rabid Russophobe and neoconservative warmonger, told the National Press Club last December that the US has "invested" $5 billion in organizing a network to achieve US goals in Ukraine in order to give "Ukraine the future it deserves." Nuland is the Obama regime official who was caught red-handed naming the members of the Ukrainian government Washington intends to impose on the Ukrainian people once the paid protesters have unseated the current elected and independent government. What Nuland means by Ukraine's future under EU overlordship is for Ukraine to be looted like Latvia and Greece and to be used by Washington as a staging ground for US missile bases against Russia. From the responses I received to my request for confirmations of the information sent to me from Moldova, there is enough evidence that Washington fomented the violent riots for western newspapers and TV channels to investigate. But they haven't. As we know, the presstitutes are enablers of Washington's crimes and duplicities. However, the US media reported that the Ukrainian government is paying Ukrainians to rally in favor of the government. The Ukrainian government will have a hard time matching Washington's $5 billion. As Karl Marx wrote, money turns everything into a commodity that is bought and sold. I wouldn't be surprised if some protesters are working both sides of the street. Of course, not all of the protesters are paid. There are plenty of gullible dupes in the streets who think they are protesting Ukraine government corruption. I have heard from several. There is little doubt that the Ukraine government is corrupt. What government isn't? Government corruption is universal, but it is easy to go from the frying pan into the fire. Ukrainian protesters seem to think that they can escape corruption by joining the EU. Obviously, these gullible dupes are unfamiliar with the report on EU corruption issued February 3 by the EU Commissioner for Home Affairs. The report says that a business-political nexus of corruption affects all 28 EU member countries and costs the EU economies $162.2 billion per annum. According to the World Bank, the economic cost of EU corruption is almost as large as the size of Ukrainian GDP. Clearly, Ukrainians will not escape corruption by joining the EU. Indeed, Ukrainians will suffer worse corruption. I have no objection to Ukrainians protesting government corruption. Indeed, such gullible people could benefit from the lesson they would learn once their country is in the hands of corrupt Brussels and Washington. What I object to is the lack of awareness on the part of the protesters that, by permitting themselves to be manipulated by Washington, they are pushing the world toward a dangerous war. I would be surprised if Russia is content to have US military and missile bases in Ukraine. It was fools like Nuland playing the great game that gave us World War I. World War III would be the last war. Washington's drive to exploit every opportunity to establish its hegemony over the world is driving us all to nuclear war. Like Nuland, a significant percentage of the population of western Ukraine are Russophobes. I know the case for Ukrainian dislike of Russia, but Ukrainian emotions fueled with Washington's money should not direct the course of history. No historians will be left to document how gullible and witless Ukrainians set the world up for destruction.